It all comes down to this! Joel White from Griffith, Indiana, who is here at his first YCS, finished with a 9-1 record in the Swiss Rounds. Now, he’s meeting Marcus Hayden from Joliet, Illinois in the Finals. Hayden finished the Swiss Rounds with an 8-2 record. 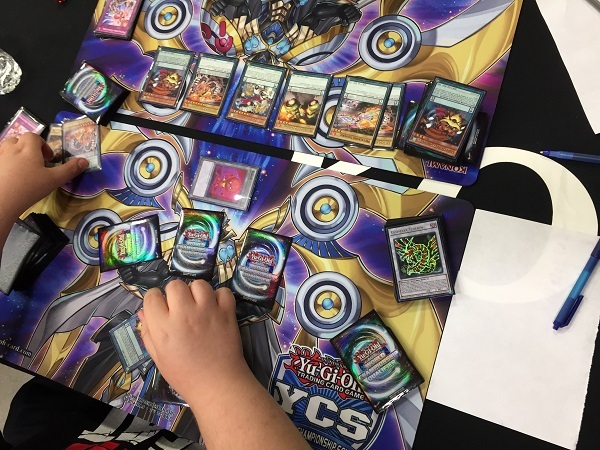 Each Duelist is using a Metalfoes Deck, but only one of them can come out on top. It’s time to Duel! Hayden won the roll and elected to go first. He started off by Special Summoning Blackwing – Gofu the Vague Shadow and used its effect to Special Summon 2 Vague Shadow Tokens. Metalfoes Goldriver was placed into the Pendulum Zone and its effect destroyed a Token to Set a Metalfoes Fusion from the Deck. Metalfoes Volflame came down next and destroyed the other token to Set Metalfoes Counter. 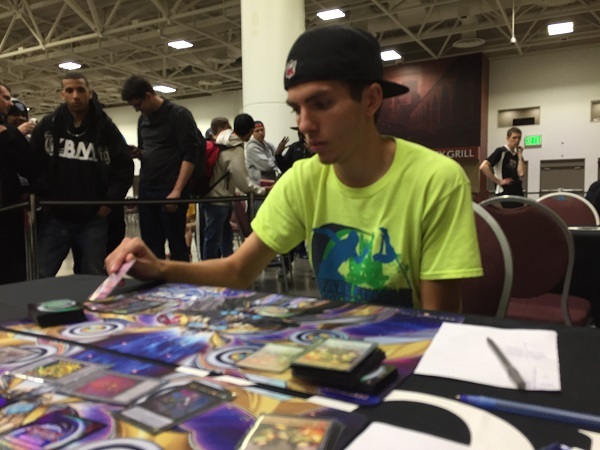 Hayden then activated Pot of Desires, banishing 10 cards from his Deck to draw 2 cards. Hayden then Normal Summoned Metalfoes Silverd and then he flipped-up Metalfoes Fusion to fuse the Metalfoes Steelen in his hand with the Metalfoes Silverd on the field and Fusion Summon Metalfoes Adamante. He then sent both it and Blackwing – Gofu the Vague Shadow to the Graveyard to Special Summon Summon Ultimaya Tzolkin! He then Set a card and used Ultimaya’s effect to Special Summon Crystal Wing Synchro Dragon from the Extra Deck! He then activated Painful Decision to send a Metalfoes Silverd to the Graveyard and add another one to his hand. He then Pendulum Summoned two Silverds and used them to Xyz Summon Mechquipped Angineer! White had a hand of Pot of Desires, Jowgen the Spiritualist, two copies of Blackwing – Gofu the Vague Shadow, Ariadne, and Archfiend Eccentric. He activated Pot of Desires, banishing 10 cards to draw 2 cards, giving him Metalfoes Counter and Metalfoes Volflame. He Special Summoned Blackwing – Gofu the Vague Shadow and activated the effect to Special Summon 2 Vague Shadow Tokens. He then Normal Summoned Archfiend Eccentric. He Synchro Summoned Ignister Prominence, the Blasting Dracoslayer using Blackwing – Gofu the Vague Shadow and Archfiend Eccentric. He attempted to use Ignister Prominence, the Blasting Dracoslayer’s effect, but it was negated by Crystal Wing Synchro Dragon. He Set Metalfoes Counter and passed. Hayden Set a card and used Ultimaya again to Special Summon his own Ignister Prominence, the Blasting Dracoslayer and that was enough for White! White elected to go first in Duel 2. He started with a hand of Metalfoes Silverd, Guiding Ariadne, Metalfoes Volflame, Metalfoes Combination, and Solemn Warning. He activated Metalfoes Silverd and Guiding Ariadne as Pendulum Scales, and used Metalfoes Silverd to destroy Ariadne and Set Metalfoes Counter. He then activated Metalfoes Volflame and Pendulum Summoned Ariadne. He Set Solemn Warning and passed. Hayden started off with Painful Decision, sending Metalfoes Goldriver to the Graveyard to add another one to his hand. He activated Metalfoes Volflame in the Pendulum Zone, followed by Majespecter Raccoon – Bunbuku, and used Metalfoes Volflame to destroy Majespecter Raccoon – Bunbuku and Set Metalfoes Counter from the Deck. He then activated Metalfoes Silverd to destroy Metalfoes Volflame and Set another Metalfoes Counter. He then activated Metalfoes Volflame and Pendulum Summoned Majespecter Raccoon – Bunbuku, but was met with a Solemn Warning. He then Normal Summoned Metalfoes Goldriver and attacked over Guiding Ariadne. 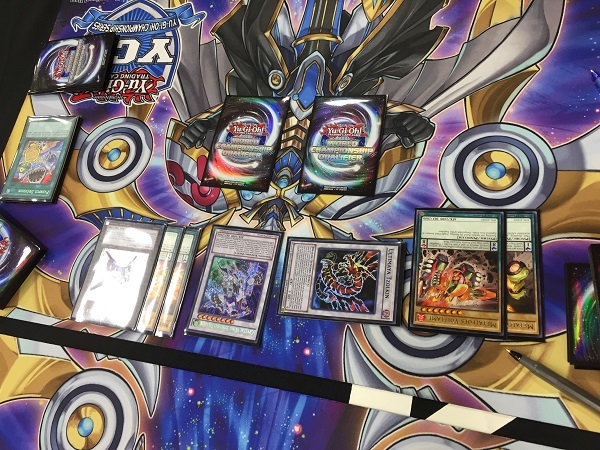 Its effect activated and he Chained Metalfoes Counter to Special Summon a Metalfoes Goldriver from the Deck. Ariadne’s effect revealed 3 Solemn Strikes, one of which was added to his hand. He Set one card and passed. White drew Blackwing – Gofu the Vague Shadow for his turn. He activated Metalfoes Combination and then activated Metalfoes Silverd‘s effect to destroy it and Set Metalfoes Counter. He then added Metalfoes Goldriver from his Deck to his hand. He Normal Summoned Metalfoes Goldriver and activated the Set Metalfoes Fusion, fusing the two monsters for Metalfoes Orichalc! He then used Metalfoes Fusion’s Graveyard effect to return it to the Deck and draw a card. He then used Metalfoes Volflame’s effect to destroy Orichalc and Set Metalfoes Fusion. Orichalc’s effect activated and destroyed one of Hayden’s face-down Metalfoes Counters. Hayden activated another Metalfoes Counter, Special Summoning Metalfoes Volflame. White then Special Summoned Blackwing – Gofu the Vague Shadow and made two Tokens, then used Metalfoes Fusion, using Metalfoes Goldriver from hand and a Token on the field to Summon Metalfoes Adamante. Metalfoes Adamante and Blackwing – Gofu the Vague Shadow were sent to the Graveyard to Special Summon Ultimaya and White Set a card, then using Ultimaya’s effect to Special Summon Ignister Prominence, the Blasting Dracoslayer! Ignister Prominence, the Blasting Dracoslayer’s effect destroyed a Metalfoes Silverd in Hayden’s Pendulum Zone and shuffled Hayden’s last Set Spell/Trap Card back into his Deck. Pot of Desires was activated next, banishing 10 cards to draw 2, he then he Pendulum Summoned Metalfoes Goldriver and Guiding Ariadne. Next, he Xyz Summon Castel, the Skyblaster Musketeer, using its effect to shuffle Metalfoes Volflame back into his Deck. Ignister Prominence, the Blasting Dracoslayer attacked over Metalfoes Goldriver, and Castel, the Skyblaster Musketeer attacked directly. White ended with an impressive field. In the End Phase, Hayden banished Metalfoes Counter from the Graveyard to add back a Metalfoes Silverd. White drew Majespecter Raccoon – Bunbuku which was Normal Summoned and the effect was used to get another Raccoon. He then used Metalfoes Fusion’s effect to shuffle it back into the Deck to draw a card (which was Metalfoes Fusion). He Set Metalfoes Fusion and passed. Hayden Normal Summoned Majespecter Raccoon – Bunbuku and used its effect to add Majespecter Unicorn – Kirin from his Deck to his hand. Metalfoes Silverd’s effect was used to destroy Majespecter Raccoon – Bunbuku and Set Metalfoes Counter. He then Pendulum Summoned Metalfoes Goldriver and Majespecter Raccoon – Bunbuku from the Extra Deck and Majespecter Unicorn – Kirin from the hand. In the Battle Phase, Majespecter Unicorn – Kirin attacked into Majespecter Raccoon – Bunbuku, then Majespecter Raccoon – Bunbuku attacked into the face-down Ignister Prominence, the Blasting Dracoslayer and Metalfoes Goldriver attacked into the face-down Ultimaya. White drew Guiding Ariadne for turn. He Normal Summoned Majespecter Raccoon – Bunbuku and used its effect to add Majespecter Unicorn – Kirin from his Deck to his hand. He then Pendulum Summoned Majespecter Unicorn – Kirin and Guiding Ariadne from his hand. He then passed. In the End Phase, Hayden used Majespecter Unicorn – Kirin to bounce his own Majespecter Raccoon – Bunbuku and White’s Guiding Ariadne to the hand. Hayden Normal Summoned Majespecter Raccoon – Bunbuku and used its effect to search for another Majespecter Raccoon – Bunbuku. He then used Majespecter Unicorn – Kirin to bounce the Majespecter Raccoon – Bunbuku and White’s face-down Castel, the Skyblaster Musketeer. Majespecter Raccoon – Bunbuku crashed into White’s Majespecter Raccoon – Bunbuku. Hayden activated Metalfoes Counter to Special Summon a Metalfoes Volflame from the Deck. With a full field of 5 monsters, Majespecter Unicorn – Kirin can only stop one attack and with only one Token remaining there was no way to stop the remaining 3 attacks from reducing White’s Life Points to zero! 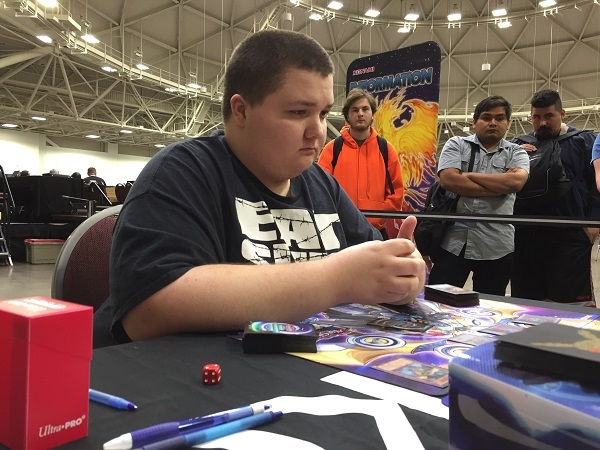 Marcus Hayden is your YCS Minneapolis Champion!